Two giants of the English language, one devoted to lifting it to new heights through proper usage, and the other devoted to making it as grimy and gritty as humanly possible were taken yesterday and today respectively, by the reaper. Harvey Pekar, the subject of the film American Splendor, was the author, creator and editor of his the comic book series by the same name. A Cleveland resident, he was known to larger audiences from his appearances on NBC’s seminal Late Night With David Letterman until he was banned for essentially being crazy (but never not interesting and funny) in 1993. Bob Sheppard was the public address announcer for the New York Yankees for more than five decades. His intonation and cadence is part of Yankee lore and during the course of his career he announced names ranging from DiMaggio, to Mantle, to Berra, to Munson, Mattingly and Jeter. He held both a World Series and a Super Bowl ring (from his work with the NY football Giants) and taught at St. John’s University. Often referred to as the voice of God, he lived to the age of 99. He never to my knowledge read over the Yankee Stadium public address system the works of Harvey Pekar, but if he did, that would have been something. 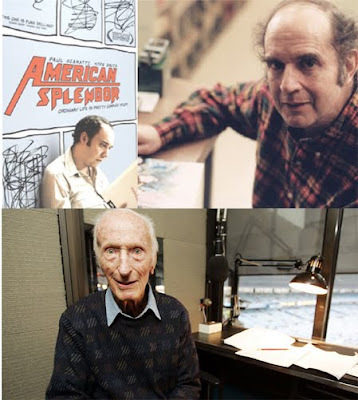 Harvey Pekar, Bob Sheppard, RIP.